All eyes eagerly watched as Tiger Roll, ridden by Davy Russell, sailed home over the finish line to win the first Randox Grand National back to back since Red Rum in 1973/1974. The Co. Meath trainer, Gordon Elliott, has added to his impressive career with three English Grand National winners including Silver Birch back in 2007, ridden by Robbie Power. Out of the Forty horses set out to take on the toughest test in National hunt racing, covering thirty fences and four and a quarter miles, eleven where trained by Gordon Elliott and 14 powered by Bluegrass Horse Feed. “I don’t know what he is feeding him, but I’m trying to get some for myself” remarked Michael O’Leary during an interview with Go racing after Tiger Roll won the Cross Country Chase in Cheltenham with ease. Bluegrass Horse Feed are proud to be the sole horse feed supplier for Gordon Elliott since 2005. 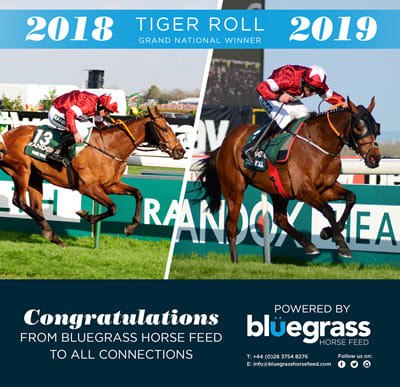 Tiger Roll is powered by Bluegrass Racehorse Cubes and Hi-Performance mix, formulated to provide the essential nutrients required so he can perform at the best of his ability. They contain natural vitamin E, 180% more bioavailable than synthetic forms, an essential antioxidant in the performance horses diet. Bluegrass Horse Feed range are formulated alongside the Kentucky Equine Research nutritional team to help create a scientifically formulated diet. Bluegrass Racehorse Cubes and Hi-Performance mix contain Stamm 30, a high quality vitamin, mineral, protein concentrate, containing unique yeast cultures, designed to support the gastrointestinal tract and enhance the bioavailability of these nutrients for rapid recovery and repair. High quality oils and super fibres within Bluegrass Racehorse cubes help to provide increased stamina and power to support these champion equine athletes perform at the best of their ability. MD of Bluegrass Horse Feed, Kenneth Irwin stated, “ History has definitely been made, we are delighted to be the feed supplier for Gordon Elliott, his team work hard and results are outstanding. The team at Bluegrass Horse Feed send our congratulations to all the connections involved”.